Word Choice: What Should I do? Use commonplace words that are frequently seen and heard. Avoid academic and medical jargon, and define technical terms. Explain things using simple words and phrases, like you might explain them to an older relative. Word Choice: Why Should I do it? 1. Familiar words are more concise and easier to understand. 2. 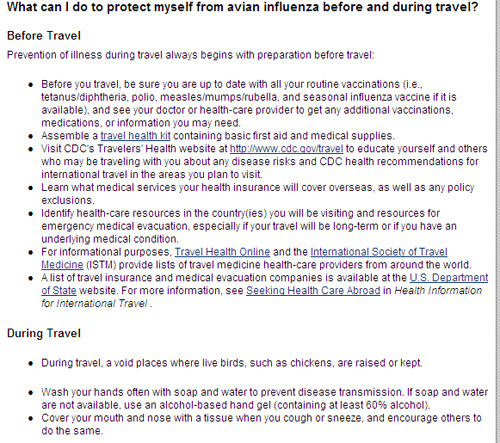 This Centers for Disease Control Web site defines the less familiar technical terms and explains things using commonplace language. Sentence and Paragraph Length: What Should I do? Limit sentences to 20 words and paragraphs to six sentences. Sentence and Paragraph Length: Why Should I do it? Shorter sentences and paragraphs enhance reading comprehension. This example from the National Institutes of Health Web site shows how to optimize reading comprehension by keeping sentences and paragraphs short. Voice: What Should I do? Voice: Why Should I do it? Active voice is more concise and direct than passive voice. We have changed our decision. The decision has been changed. Sign all copies of the application. All copies of the application must be signed. Verbs: What Should I do? Verbs: Why Should I do it? Action verbs are clear and direct and improve understanding. Keep Prose Concise And Objective: What Should I do? Delete unnecessary words and extraneous statements that do not add information or clarity. Keep text objective rather than promotional in tone. Keep Prose Concise And Objective: Why Should I do it? Users reading for information become frustrated by unnecessary text that does not add to their understanding of something. They also read more slowly from computer screens than from paper. See "Measuring the Effect of Improved Web Writing" in Jakob Nielsen's landmark article, How Users Read on the Web, at http://www.useit.com/alertbox/9710a.html, for examples of how to improve reader comprehension and satisfaction by writing concisely and objectively. Make Key Ideas Obvious: What Should I do? Use meaningful headings and subheadings to highlight page contents and reveal the organization of information. Break paragraphs into bulleted statements where possible. Make Key Ideas Obvious: Why Should I do it? Most users (80%) visually scan a page looking for cues to tell them whether the page contains information they are interested in reading. If it is too hard or time-consuming to determine what the page contains, users are less likely to start reading and more likely to go elsewhere for the information. When pages are visually scannable, users find information faster, retain information better, and report higher satisfaction with the site. This Centers for Disease Control Web page breaks up text with headings, subheadings and bulleted statements so users can easily find and read information. Make Long Reports Easier To Read: What Should I do? For pages that contain lengthy text, provide a clickable list of sections or contents at the top of the page. Make Long Reports Easier To Read: Why Should I do it? 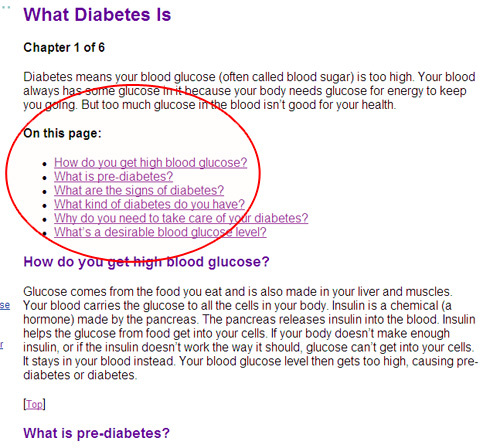 Users look for cues to tell them whether the page contains information they are interested in reading. They are less likely to read a long report if they don't know ahead of time whether it will be worth the effort. Clickable lists (also called "anchor" or "within-page" links) show what is on the page and allow users to quickly navigate to the desired information. In this long report on the National Institutes of Health Web site, a list of clickable subheadings shows readers what the report contains and gives them quick assess to specific sections of interest. Make First Sentence Descriptive: What Should I do? Include the main theme of each paragraph in the first sentence of each paragraph. Make First Sentence Descriptive: Why Should I do it? When skimming a page looking for information, users tend to read only the first sentence or two of each paragraph to determine whether the page contains information of interest. 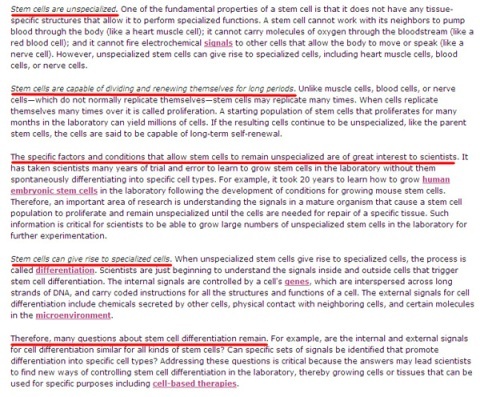 This page from the Stem Cell Information section of the National Institutes of Health Web site uses descriptive first sentences (underlined in red) to set the theme of each paragraph. Weiss BD, "Assessing Health Literacy in Clinical Practice," CME/CE. Medscape. Release Date: November 28, 2007 <Technical Communication. 2000;47(3):359-82. Nielsen-Bohlman LN, Panzer AM, Kindig DA, eds. Health Literacy: A Prescription to End Confusion. Committee on Health Literacy, Institute of Medicine, Washington DC: The National Academies Press; 2004. Executive Secretariat, Office of the Director, National Institutes of Health, "Writing Clearly." The Plain Language Initiative, <http://execsec.od.nih.gov/plainlang/guidelines/writing.html>[December 6, 2007]. Spyridakis JH, Guidelines for authoring comprehensible web pages and evaluating their success. Technical Communication. 2000;47(3):359-82.